Best Types of Fences for the PNW | Pacific Fence & Wire Co. When building a fence, it’s important to consider the styles of fences available to you. Regional weather will expose fences to different elements, all of which can have an effect on your fence’s integrity and appearance over time. Here in the Pacific Northwest, we face several different environmental forces; in particular, rain and wind. Wood in particular requires maintenance, as this material is porous and subject to rot, moss growth, and other issues. However, fence structure can help to make the most of this climate and help you maintain your fence for years to come. 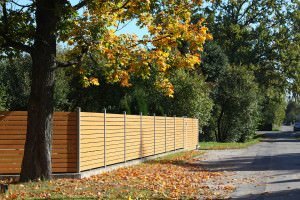 The following are some of the best types of wood fences for properties in Oregon and Washington. An American classic! This fence type is likely familiar to anyone who grew up in a suburban town that mostly utilized lower fences. The pointed design of these fence posts helps to wick away water, a perk for those landscaping in and around Portland, OR. This type of fencing is elegant and simple, perfect for anyone reminiscent of old-fashioned stables and the imagery they invoke. They’re suitable for any kind of Pacific Northwest terrain, including Oregonian forests. Ranch owners and urban homesteaders, listen up! This particular style of fence does what very few fence styles profess to do: block the wind while ensuring privacy. It’s also an attractive style. Ready for the ultimate natural fencing? Wattle is an excellent choice for Pacific Northwesterners looking for a sustainable fencing option. The natural woven materials can also take root in the ground and become permanent fixtures if the homeowner wishes. It’s a great way to guard against wind (and even fence in small animals) without disturbing the natural look of a backyard. What’s one of the top complaints of people who install a wooden fence in the Pacific Northwest? Warping. This type of fence is designed specifically to lock the supporting boards together, eliminating warping within them. As unusual as they can be, fences with added roof sections are ideal for the volatile weather of the Pacific Northwest. They protect the main sections of the fence from the main brunt of rain, hail or snow. They also evoke a homey feel,which matches many aspects of Pacific Northwest architecture. If you’re considering having fencing installed or replaced, contact our experts at Pacific Fence and Wire today! We’re happy to answer any questions you may have!